Welcome to another edition of Turkish Food Focus. Last week, we shared a recipe for a white bean dip which is a perfect addition for your meze table when you’re entertaining. This week is similar in that we’ve got another Turkish recipe for you, except this time, it’s a main meal and a current foodie obsession of ours. Whenever we eat out and try new Turkish foods, we’re those annoying people you see in the restaurants and lokantas inspecting the food with a fork before we eat it. It’s not because we don’t trust the food put before us, but because that’s one of our methods for working out ingredients so we can attempt to recreate dishes at home. Between this, picking friends’ brains for information, reading and, more recently, learning from others in our Google+ Turkish Food Community, we manage to conjure up some of our favourite dishes. And so you may remember that while we were in Izmir back in September, we hiked up a very steep hill to Kadifekale and then rewarded ourselves with a tub of the famous Turkish streetfood, nohutlu pilav. So much did we enjoy it, that we’ve been cooking it at home ever since. This dish is so easy, cheap to make, fantastically filling and really tasty. We make it with the leftovers from when we buy kömürde piliç (barbecued chicken) and it helps our chicken go much further. Very finely chop one small onion and thinly slice a small green pepper. This is exactly the same method as our Turkish rice recipe with a few added extras. Over a low heat, melt a knob of butter in a large saucepan and throw in a handful of şehriye (vermicelli) and stir around for a few minutes. Now add a cup of rice (the size of an average coffee mug) and stir. Turkey has lots of rice types and we find the best one for this dish and Turkish rice is baldo pirinç. By now, your pan is going to be really hot, so it’s time to add more ingredients and set your rice mixture cooking. Give everything one stir, bring the stock to the boil, cover the pan and simmer for ten minutes. We leave a slight gap to let some of the steam escape. While the rice is simmering, you can start to tear bits of your leftover chicken from the carcass. We used quite a bit of chicken on this occasion but you only really need a suggestion, so, even if you only have little scraps of chicken left over, they’ll work just as well. After ten minutes, the stock should have been absorbed by the rice. Remove it from the heat and now you need to work fast. Lift the lid from the pan, sprinkle chilli flakes over the rice (optional) and sprinkle the chicken pieces over the top. Replace the lid, tightly, and leave for five to ten minutes. Remove the lid and now you can either take out the chicken and put on a plate or leave it in the rice. 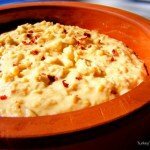 Give the rice and chickpeas (nohutlu pilav) a good stir and serve. As a Turkish street food, nohutlu pilav is sold from glass-covered carts and is served lukewarm. When we make nohutlu pilav at home, we let it cool down a little as it tastes much better than when it’s piping hot. It goes really well with a side of süzme yoğurt (thick Turkish yoghurt) and turşu. If you want to make the dish healthier, you can substitute the butter for olive oil…but you’re going to miss out on the rich, buttery flavour of nohutlu pilav if you take this option. I’m just like you guys when I try new foods. If it’s a dish I really like, I want to try and discern what the spices are, etc. 🙂 This is indeed a filling dish and a good way to use up leftovers. I love nohutlu pilaf, but, alas, someone is my family is allergic to wheat, so haven’t been able to make it. Any thoughts for alternatives for the vermichelli? This is one of my favourite recipes when I buy ready cooked chicken and chickpeas. On the table 15 mins after walking through the door. @ Joy: But it gets embarrassing sometimes when you’re in the restaurant and the waiter is watching you pick through the foods. 🙂 Still, needs must. Nohutlu pilav is one of the best street foods in Turkey! You made a great twist on it! I’ve never thought of adding green pepper or red chili into it, sounds great! Nohutlu pilav goes perfect with ayran too!